Each passenger travelling through Honolulu International Airport can look forward to receiving the famed Aloha treatment. The members of staff handling visitor information are available in-between 4:30 a.m. and 11:45 p.m. (Hawaii Time) on daily basis to address questions, concerns or comments from travelers. You will find information desks located at strategic spots throughout the airport. In case they are unstaffed, feel free to call (808) 836-6413 for further assistance. HNL provides a host of options for dining and shopping, with their hours of operation depending upon flight schedules. There are multiple numbers of concession locations scattered all across the airport. Expect to find cafes, coffee shops as well as full-service restaurants available to suit your taste. Hawaii Honolulu avails a full array of accessibility services across the entire airport. These include various Overseas, Interisland as well as Commuter parking areas. Honolulu International Airport has customized its facilities to cater for passengers with special needs in natural fashion. For the best attention possible, it is still advisable to undertake prior planning in such situations. Equally, Go Waikiki shuttle is equipped well to provide shuttle transportation and private car service that meets the expectations of passengers with disabilities. Public parking is available at HNL within several parking lots and garages. 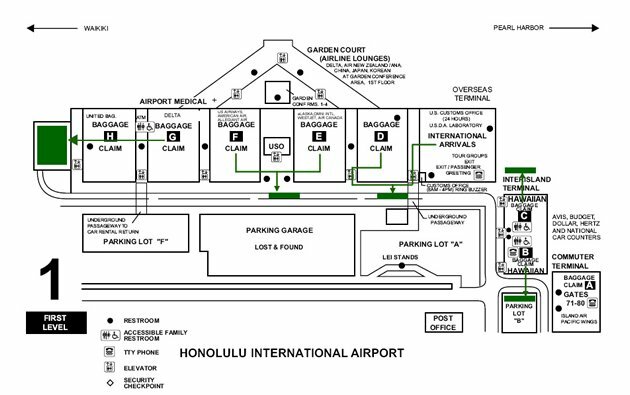 There are several ways to gain access into and out of Honolulu International Airport. HNL is situated just 6 miles from downtown Honolulu and 10 miles from Waikiki. You can access it easily using any of our vehicles, whether private ones or the shuttles of varying capacity. Both the Westbound and Eastbound exits found on H-1 Interstate Freeway, channel traffic directly into the airport. © 2019 Go Waikiki Shuttle. All Rights Reserved.